Mighty No. 9 is an action video game, developed by Comcept and Inti Creates, in the classic mold Mega Man includes several new features over the old formula, as a Dash system and several extra modes. Check out how to play the game, from basic controls to advanced maneuvers, and see which weapons to use against the bosses. 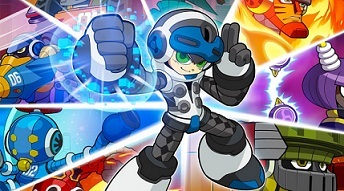 As in the classic Mega Man, Beck can gain the weapons of the bosses, the other robots in Mighty No.9, after defeating them use their weapons to exploit the weaknesses of the next. The order to face them is Pyrogen, Cryosphere, Battalion, Seismic, Brandish, Dynatron, Countershade and Aviator. It is not mandatory to start with Pyrogen, but he is one of the easiest. His weakness is against the Aviator weapon. The great advantage of Mighty No. 9 in relation to Mega Man is the introduction of mechanical "Dash", here called AcXelerate. Shoot the enemies until they are destroyed -takes a long time, but you can weaken them with a few shots and then absorb them with your Dash. Once absorbed, each type of enemy offers a bonus for the attributes of the protagonist Beck. Red increases your attack power and make the shots cross targets, Yellow reinforce his defense, Green leave Beck faster and Blues meet the energy tanks booking, AcXel Recover I and II. An important detail is that Dash can be used several times in a row. In many areas of the game you need to master the technique of cross large chasms or dangerous parts with several Dash, one behind the other. In addition to the basic controls, Mighty No. 9 has some more complex maneuvers for players who want to maximize their performance. The first is a variation of the common Dash. Pressing down before using a Dash, you can direct your Dash, which can speed up the fall of Beck or absorb enemies below him. However, it does not stop until it reaches the ground, then beware of the abyss. The other two maneuvers are performed with the "Action Shift" button, the right trigger (R2 / RT) of video games. Combine it with the attack button as R2 + Square / RT + X, and Beck will jump back while shooting down diagonally. Use it with the jump button, R2 + X / RT + A, and Beck will just jump back. The campaign game (Main Game Mode) is the main highlight, but there are still other ways. In Challenge you face several rooms with their own specific challenges (Solo) or with a partner (Co-op). The rooms come with adverse conditions such as cannot shoot or use the Dash. In Boss Rush mode you can challenge all the bosses of the game in sequence, without having to go through the steps to meet them. In the Online Race Battle can play races with players around the world, with options such as time limits, possibility of combat and sudden death.